Cydney Foote: I often hear applicants say “I thought the admissions committee would want to hear about _____” (fill in the blank with research, a medical mission, or a leadership role). But those are not what the admissions committee wants to hear – they want to hear about you. You are the topic, and your experiences are simply ways to demonstrate that you have the qualities that medical schools want. Dr. Herman Gordon: Appreciate your audience. Admissions reviewers use your personal statement to get to know you as a person. They want to hear your voice. So talk to them. Craft your statement carefully so that admissions reviewers understand the arc of your life: where you’ve come from, who you are now, and who you want to be. Alicia Nimonkar: Journal every day to increase your writing stamina. The application process involves more writing than most students expect and it catches them off guard. Writing a little more every day can make the process flow more smoothly but also give you an opportunity to self reflect and celebrate the process. Also, continue seeking new activities and experiences so that you will have something new to talk about in each stage of the application process – from the primary application to the secondaries to the interview and to update letters. Dr. Suzi Schweikert: Keep a journal of experiences that make you feel stressed, challenged, or fulfilled. These might be good things to write about in an essay later on. Dr. Barry Rothman: The fastest way to med school is to go slowly. Many students feel an urgency to apply, and wind up applying prematurely. You’ll be a stronger applicant if you take your time and live a balanced life, even if that means applying a year later. Also, continue to take upper-div Bio electives and accrue clinical experience. Get help realistically evaluating your prospects at MD and DO schools. Have you started the med school application process yet? What’s your top piece of advice for fellow applicants? We’d love to hear your tips! You can do more than just read the advice of our expert consultants – you can start working one-on-one with one of these or any of our other admissions gurus! And NOW is the time to get started on the long, gruelling med school application process. 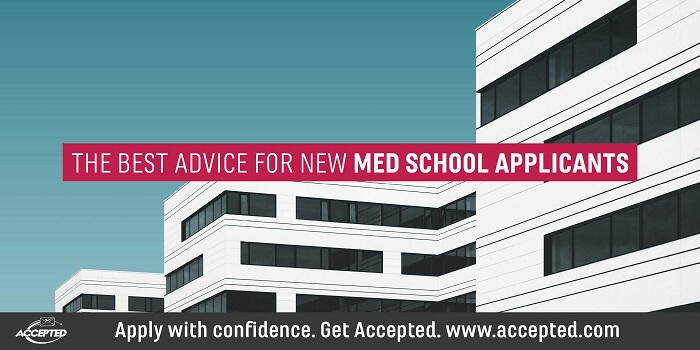 Explore our Medical School Admissions Consulting Services and work one-on-one with an expert advisor to create an application that will get you ACCEPTED! Last updated on December 21, 2018.